KGeography questions: Top Left or Centered? We the KGeography developers are in a disagreement of what looks better, centered questions or top left aligned ones, so we are opening this poll for you the users to decide. Please hop onto this post on the KDE Forums and vote! On the other hand when you write something in the comment field, it only appears as a comment to the translator, so if you have two texts with the same text (e.g. "Run") and different comments (e.g. "Verb" or "Noun") it will not work, so only use the comment field to give extra information for fields whose text is unique but the meaning might not be easy to understand to the translator. 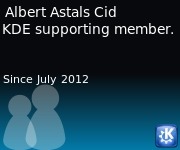 We just published the schedule for Akademy-es 2011 that will happen in Barcelona from 20 to 22 of May. Make sure to register if you plan to attend!